Bartwood Construction provides emergency services 24 hours a day, 7 days a week, and 365 days a year. Our WRT certified, highly trained and experienced emergency service technicians will mitigate the damages to your home, or business, resulting from water, fire, wind or other peril. Our goal is to halt further damages in the affected areas, preparing them for necessary repairs. By employing the latest equipment and relying on the experience and knowledge of our emergency service technicians, we have accomplished that goal for thousands of Southern California homeowners. Our WRT certified emergency service technicians will be the first individuals from our company you will encounter. After signing the necessary paperwork, our crew will survey the affected areas of your home. They will then advise you of their findings and the recommended steps needed to effectively mitigate the water damage. These steps may include water extraction, setting up equipment, removing wet building materials and moving personal belongings from the affected areas. 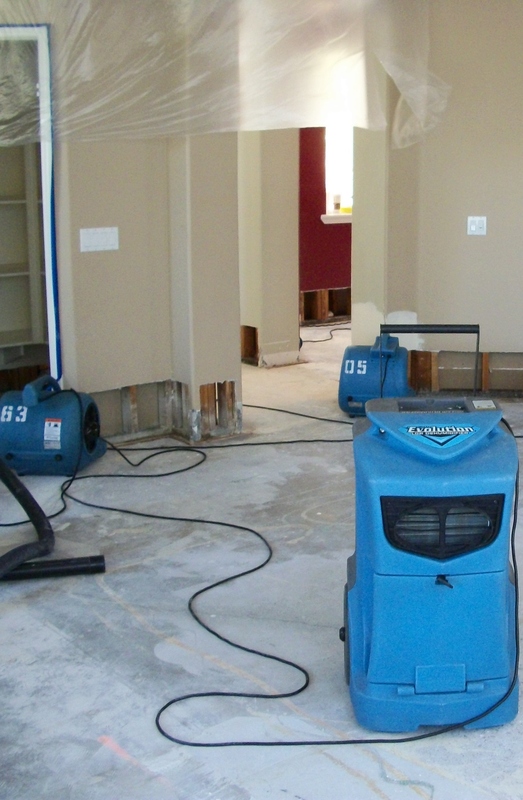 Some of the equipment you may see includes air movers and dehumidifiers. The air movers create airflow that helps promote evaporation of the water and the dehumidifiers capture the moisture in the air through the process of condensation. We employ a variety of other specialized equipment that helps direct the airflow to create ideal drying conditions in different areas of your home. They can be used on flooring, inside wall and ceiling cavities and underneath cabinets. It may also be necessary to install plastic containment barriers and drying chambers to isolate the affected areas and maximize the equipment performance. Our crew will continue to monitor the drying process over the next 3 to 5 days. They will perform a moisture check in the affected areas and determine whether we need to add or remove any equipment. To expedite the drying process, it will be necessary to leave the equipment on at all times. The equipment may generate a substantial amount of noise, humidity and heat; therefore it is imperative to call us if you find it necessary to turn it off. At the direction of your insurance company, we may need to schedule a plumber to perform a leak detection. This would be necessary in order to locate the source of the water and determine the most cost effective method of repair. We may also need to schedule an environmental testing company to test the affected areas for asbestos, lead and/or bacteria depending on the age of your home and source of the water. If the test results are positive and the building materials need to be removed, an environmental contractor will be scheduled to perform the necessary work. We make sure to stay in constant contact with you and your insurance company at all times throughout this process in order to make this stressful time as easy as possible.